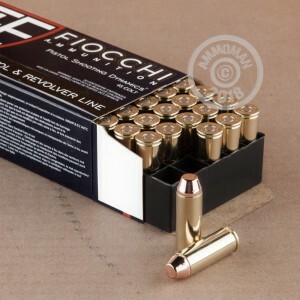 Range training ammo at its finest, this 45 Long Colt ammo from Fiocchi will have you racing to the range with your favorite revolver in hand. 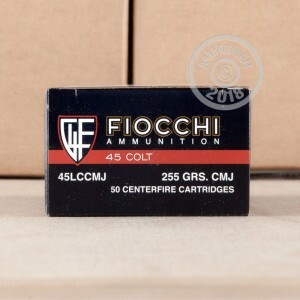 The 255 grain bullet features a complete metal jacket (CMJ) that is perfect for indoor range training; Fiocchi's version of the total metal jacket reduces lead particles in the air that can be released when firing a bullet with a lead core. The CMJ is typically more accurate than the FMJ bullet style, thus ensuring you have every advantage when practicing your marksmanship. The flat nose of the bullet will leave gorgeous round holes on your paper targets. These 45 Long Colt rounds feature Boxer-primed, new-production brass casings that are reloadable. Rooted in Italy, Fiocchi has a long standing reputation for excellence that they have been cultivating since 1877. Their stringent quality procedures ensure each round shipped from their facilities lives up to the prestige of their family name. 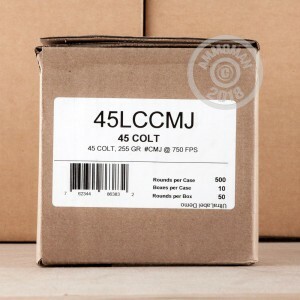 Order 500 rounds of this 45 Long Colt ammo by Fiocchi today and the shipping is on us!